Everything is ready for the 22nd edition of Cartoomics Movies, Comics and Games 2015, the Milanese con which will be held in Fiera Milano Rho (Stands 16 and 20), from the 13th to the 15th of March, 2015. 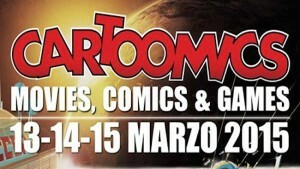 Cartoomics first opened its doors in 1992, achieving a steady presence in the international panorama of cons. Last year it welcomed 55,000 visitors in three days. The big news this year is that the Italian Association for Tolkien Studies (AIST) will also take part, manning three stands and presenting three events within the Fantasy programme. In the Villaggio Fantasy’s official stand you will be able to find the illustrations of Ivan Cavini, a renowned Tolkien artist, who will also be there to offer sketching lessons – this is a great opportunity to get his autograph! At the same location there will be copies available of the books from the series “Tolkien e dintorni”, published by Marietti, as well as gadgets and the like. Agora’ Fantasy is a place to discuss Fantasy in more depth and AIST will deliver three Tolkien talks there. Sunday 15th at 11:30 Claudio Antonio Testi La Terra di Mezzo tra angeli incarnati e pagani virtuosi (Middle-earth, between incarnate angels and virtuous pagans).